This is the second time that we have made pretzels. 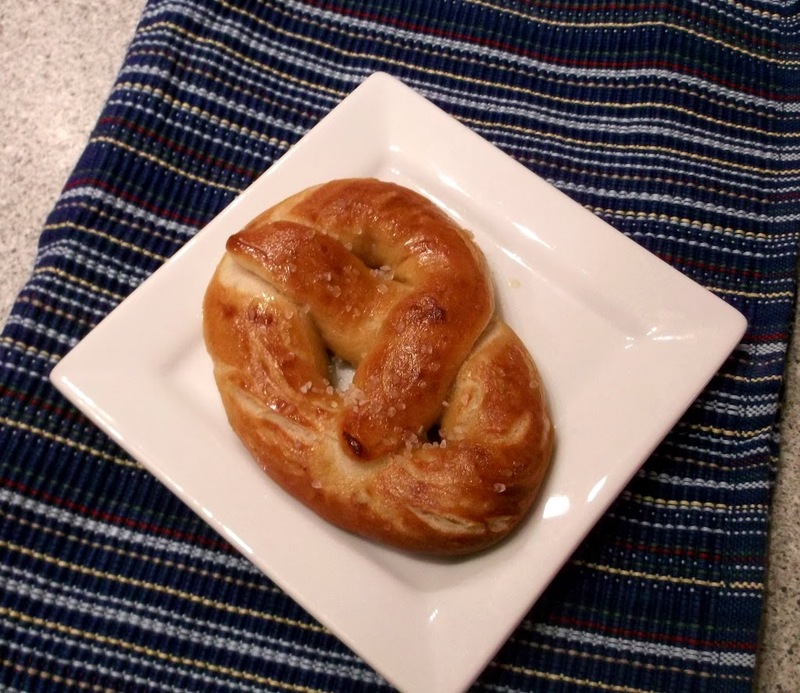 The first time we made the pretzels, they didn’t have that chewy texture that soft pretzels normally have. At first I thought it was the recipe that I used, but then I remember that we didn’t add the baking soda to the water that you dip them into before baking them. This time I made a point to not forget the baking soda and what a difference it made. These pretzels had a nice chewy texture to them, like the ones that you purchase. 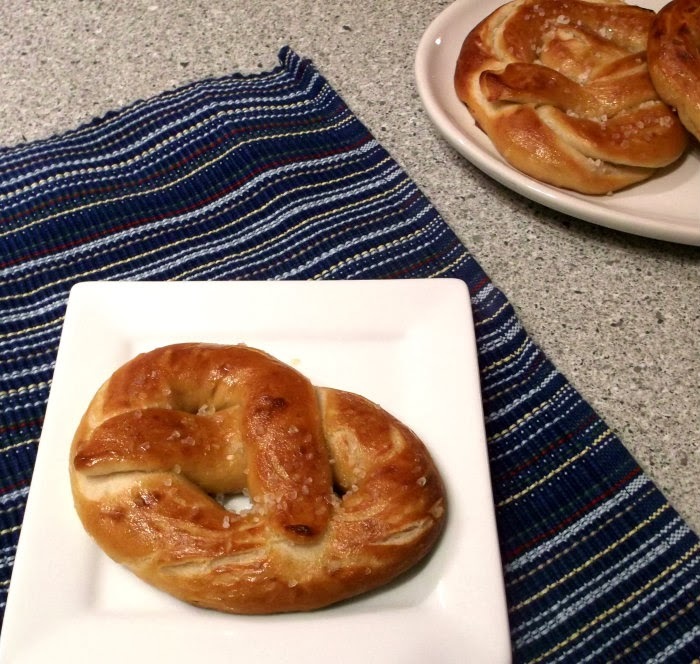 Mike and I both love the homemade pretzels; we made them together, so it was a fun project to do together. It was a nice snack, they are yummy to eat alone or you can dip them in cheese sauce, mustard, or whatever your taste buds are calling for. 1. In a large mixing bowl, dissolve yeast, brown sugar, and salt in 1 1/2 cups warm water. Stir in 3 cups of flour and knead in the remaining amount of flour just until dough is not sticky. Continue to knead in the bowl until the dough is smooth and elastic. Grease the bottom on the bowl and turn dough to coat both sides. Cover, and let rise for an hour. 3. After the dough has risen, cut into 12 pieces and roll into ropes about 20-inches to 22-inches. Twist into pretzel shapes. 4. While shaping the dough add water to a large kettle along with the baking soda, bring water to almost the boiling point. Once the dough has been shaped lower them into the heat water for 30 seconds. Remove and place on a greased baking sheet. 5. Once the pretzels are done with the water and placed on the greased baking sheet, take an egg yolk and beat with one tablespoon of water. Brush the tops of the pretzels with the egg yolk. 6. Bake in the preheat oven for 10 to 12 minutes or until golden brown. Brush with melted butter and sprinkle with sea salt or your favorite topping. 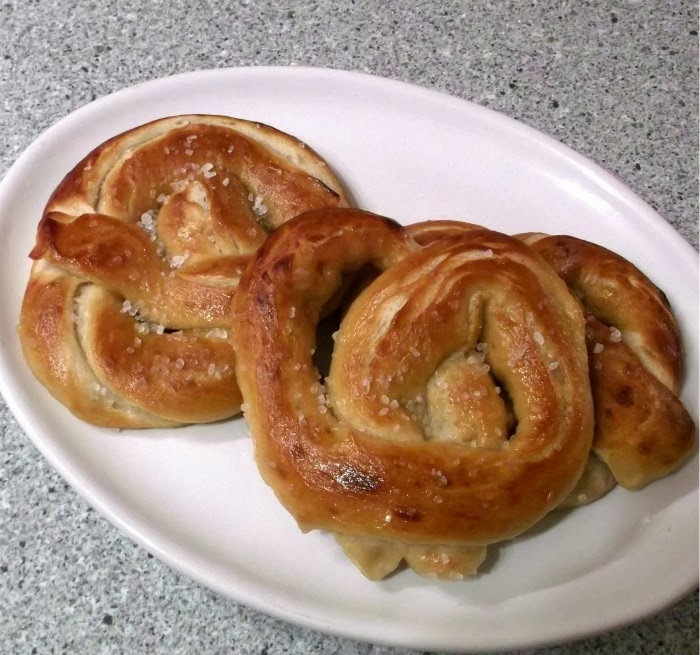 Love homemade pretzels. My family eats them all right out of the oven. I don’t do as well as you do at twisting them so I stick to the pretzel bites. These look great! I’ve not made pretzels, and they’ve been on my oist of stuff to make forever. Thanks for the inspiration!